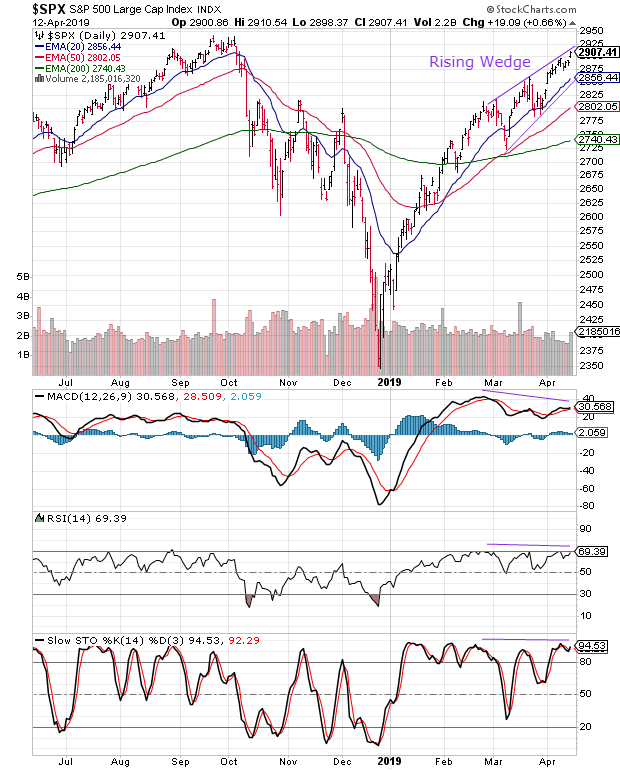 The daily bar chart pattern of S&P 500 consolidated sideways within a 27 points range during the first four trading days, but formed an upward 'gap' to close above the 2900 level on Fri. Apr 12. Trading pattern during the past 6 weeks has formed a bearish 'rising wedge' from which a downward breakout is likely. A correction will improve the technical 'health' of the chart - enabling the index to rise to a new high. All three EMAs are rising and the index is trading well above them in a bull market. 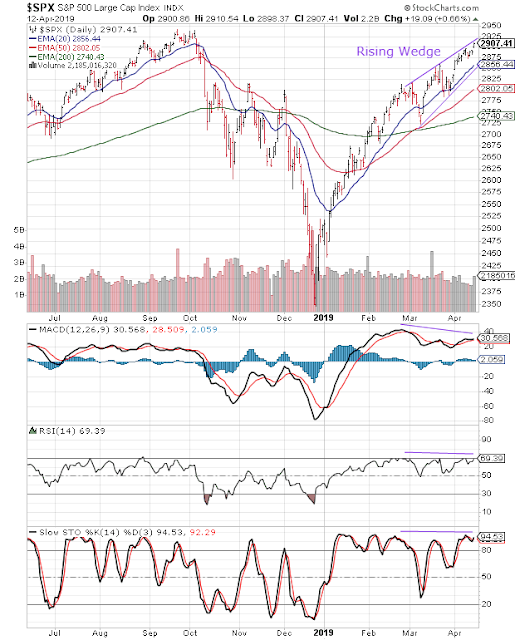 However, negative divergences visible on all three indicators - which failed to rise to new highs with the index - can trigger some correction or consolidation. 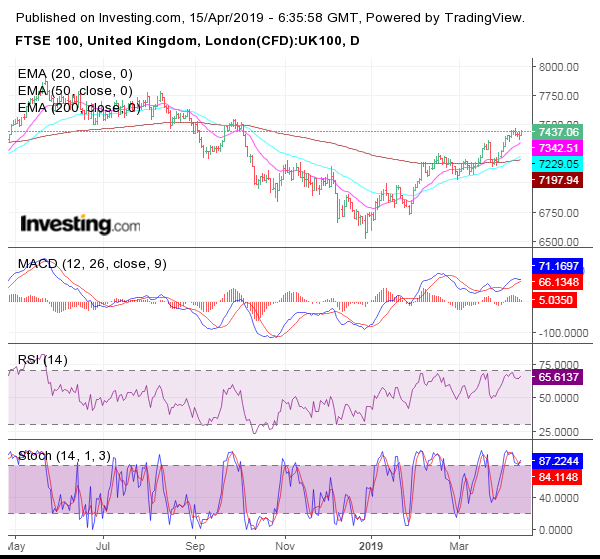 The daily bar chart pattern of FTSE 100 consolidated sideways during the week. The possibility was mentioned in last week's post. The index touched the week's high of 7478 on Tue. Apr 9, but formed a 'reversal day' bar (higher high, lower close) that triggered a mini correction towards the rising 20 day EMA on Thu. Apr 11. A bounce up on Fri. Apr 12 to a close at 7437 could not prevent FTSE from sustaining a 10 points loss for the week. 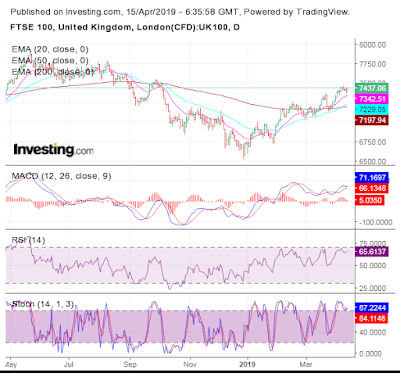 However, the 'golden cross' of the 50 day EMA above the 200 day EMA has technically confirmed a return to a bull market. The BrExit 'can' has been kicked down the road. Since UK will now remain in the EU till Oct 31st, they will participate in the European parliamentary elections next month. This uncomfortable reality is dawning on Europeans. Are you a long-term investor? Are you confused and perplexed about which stocks to buy from the thousands that trade in the market every day? Help is at hand! The monthly newsletter provides detailed analysis of a fundamentally strong but under-the-radar stock, with monthly technical updates to identify entry/exit levels. For details, send an email to mobugobu@yahoo.com. Your email will be kept confidential.